Posted by Laurie Wasko, Ph.D.
Then we get the call . 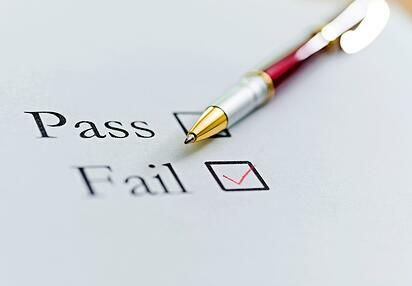 . .
What it takes to fail the assessment – that the candidate likely scored REALLY low in some important attributes like compassion, collaboration, or patient-focus and service-orientation. That the test isn’t perfect and there will be the occasional candidate who does poorly but could have been a decent performer in the role and similarly, a few people who do well on the assessment but aren’t that good on the job. However, data shows the test is a better predictor than what’s currently in place when you look at the applicant pool, as a whole. With the structured, objective approach, we’re making better decisions over time. That although we may have a preconceived notion about a candidate based on a resume review, interview, or simply because we know them, the candidate still may not be a high performer in a particular job. The assessments are measuring key behavioral competencies and tendencies that are hard to observe in casual interactions. No source of information is as predictive or well-developed as an objective assessment. To think about their past experience relying solely on the resume, or the opinion of a former co-worker or the candidate’s aunt – how often do those candidates turn out to NOT be what you were looking for? Are you saying you’d let the niece through if she didn’t interview well? Sounds like in the past, an informal reference from a former co-worker, a stellar resume or being someone’s niece trumped the sort of objective data that predicts performance – how likely is THAT approach to help you build a high-performance, patient-centered culture where the performance bar is being raised, not lowered? That your team recognized that there will be the occasional situation where keeping the position open a bit longer, rather than taking a middling candidate, is a better option. The importance of consistency in hiring, from a legal defensibility perspective. Exceptions to objective decision-making processes cause chinks in your armor. Use pass/fail methodology only when it makes sense. When you have a large candidate pool and you need to narrow your focus on those most likely to succeed, a pass/fail methodology has a lot of utility. Otherwise, consider using the assessment results as information considered as part of the overall decision-making process (rather than a hard cut). DO NOT underestimate the importance of senior team buy-in and manager-level training when implementing a structured selection solution. The organization needs to know that you are establishing a new bar for hiring quality and it will be different than what they’ve done traditionally. They’ll understand the idea of “evidence-based” hiring – i.e. putting tools and processes in place that statistically increase the likelihood of making better hiring decisions – decisions that support the organization’s goals. Know that you’ll likely need to re-do the training soon after someone’s niece (or best friend, or former coworker) fails the test. Constant education and reinforcement is key to a sustained implementation. Finally – make sure you establish clear program performance metrics. Nothing gets everyone over these concerns faster than data showing that hiring managers are saving time by interviewing fewer, better-qualified candidates, that time to fill is going down, turnover is reduced, that selection system data correlates with job performance, and that patient satisfaction scores are going up. Using tests as a hard cut point in the hiring process can have great utility. Many companies do it, but you probably need an assessment vendor/consultant who knows how to do this in an effective/legally defensible manner, and in a way that’s likely to “stick” in your organization. You may need guidance on how to perform a valid job analysis or validation study specific to your situation. You maybe need some advice or guidance on the types of difficult conversations that might be coming your way with an assessment solution implementation, and ways to effectively address those concerns. You may not – but may need some guidance on these points. If a vendor avoids even discussing these topics, they may not have that expertise. Laurie Wasko, Ph.D. is the Director of Consulting Services at Select International, a PSI Company.